THERE'S EXCELLENT NEWS FOR FANS of 1960s auto design with this new 1:25 Moebius kit of the 1965 Plymouth Satellite. Mat Irvine: Not so long ago, the idea of a relatively small model company producing brand-new 1:25 scale car models, and to a high degree of detail, would have earned a somewhat sideways look. But Moebius Models has done just that, first with the excellent 1950s Hudson and Chrysler cars, and now with pick-ups and sedans from the 1960s. These have all been of subjects previously not released as kits, and this also applies to the new 1965 Plymouth Satellite. Side panels on box (above, below) show details, useful for finishing the model accurately. The Moebius Plymouth Satellite is a fully-detailed kit, complete with engine, chassis and interior. There are no dramatic build options, really being down to just installing the hood open or shut. So no worries there, just get on with it, and enjoy building the stock showroom version. As is typical with Moebius kits, you get fully-detailed colour instructions that tell you step-by-step the precise order of assembly, with extra notes where some points may need clarification. The colour printing is particularly useful for precise engine colouring, and there is even a photo of details required for the instrument panel. A list of stock body colours is given, complete with Chrysler and Ditzler paint codes if you want to match the finish precisely. Ditzler was the standard automotive paint producer of the time; the company is now owned by PPG Industries. A page (below) from the excellent instructions. Moebius has really gone to town with the pictures and labels. Component layout (below). Most parts are moulded in white, plus chrome-plated, clear, and black vinyl tyres. Sub-assemblies (below) shown here before painting. Clockwise from top left: the engine block, engine bay, seats and front sub-frame. I detailed the chromed wheels (below) using a thin wash of matt black paint, as shown at left. It makes a surprising difference to the realism of the finished model. I applied the same detail treatment to the grille (below). Note the difference between the wash, as applied to the left part of the grille, compared to the untreated right side. Engine in place (below) and assembling the interior. The finished engine bay (below) before fitting it to the body. The interior has been fitted (below) to the chassis. This tends to be the assembly style in today's car kits; it used to be the case that interiors were fitted up into the body, before both were attached to the chassis. The completed engine bay (below) without the hood in place. Underside (below) showing that plenty of detailing has been incorporated by Moebius. The underside was often tinted with the body colour, where it had crept underneath and oversprayed the underseal. The finished and assembled model (pictures below) makes a fine replace of a lesser-known automobile from the 1960s. I added some suitable 1960s figures (below). These come from a set by US company JTT and Partners that supplies generic male and female figures to 1:24/5 scale. The only real extra you will require to finish the kit off well is BareMetal Foil - this is, after all, a car of the 1960s, where chrome was king. But even here, badges that could be covered with BareMetal Foil are supplied on the decal sheet. So you have a choice. 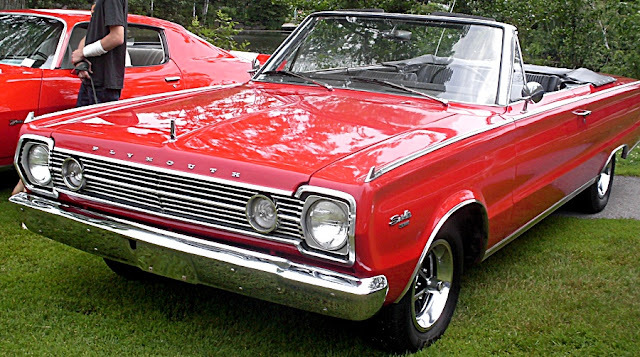 SMN note: Perhaps Moebius could release the1966 Plymouth Satellite Convertible (below) in future. Hard and soft tops would look good together as a display duo.